I am not sure how much of what’s on show here is really surrealism, nor am I clear about what could possibly be considered controversial in London today. In fact, most of the works in the show, demonstrate a high level of skill and understanding of craft, and in an era of “non-skill-based art”, that’s probably the most controversial part. Is it provocative? That’s entirely in the eye of the beholder. I didn’t find it provocative, nor especially original, but I did find it interesting and often rewarding. Originality can be overrated. Sometimes the best story is an old story, told in a fresh and appealing way. This year’s exhibition is particularly interesting due to the inclusion of two stunning pieces by the late HR Giger, the Swiss artist and designer who is perhaps best known for his conceptions and designs for the movie Alien. Though clearly influenced by Francis Bacon, Giger referred to his work as ‘biomechanical’, since his drawings and paintings, (many of which were turned into sculptures as well as film props), portray cybernetic biological combines. Giger claimed that “I paint from reality,” but perhaps it is the reality that one finds in nightmares. 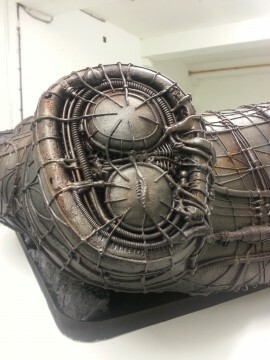 The Giger Museum sent two sculptures, which are both scale models of pieces created for the original Alien movie. They are incredible, and there’s nothing else like them to be seen anywhere. 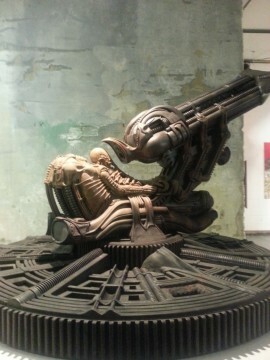 One thing that’s very clear from looking at the sculptures, is that drawing is simply the essence Giger’s work, reflecting his early training in architecture and industrial design. 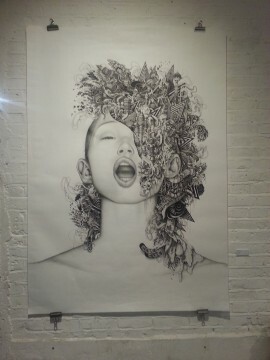 There many excellent examples of drawing in the show, with a particularly good large piece by graphic artist Iain MacArthur. Street and graphic artist Demitri Nezis aka The Krah contributes some entertaining comic pieces. However, it could’ve been interesting to see some drawing which pushes the boundaries a little bit more, stuff somewhat more experimental, while retaining high graphic quality. It seems so often that drawing is trapped between quite traditional approaches, and the postmodern conceptual crap that claims “anything is a drawing”, even if it clearly isn’t. Surely, there has got to be middle ground? As last year, there’s some good sculpture, particularly by people with theater design backgrounds and my personal favorite was the piece by Ann-Marie Johnson. 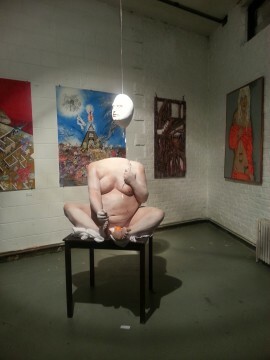 You really couldn’t miss this, it completely dominated the room, being visually appealing and creepily lifelike. It is not completely perfect, it has some rough edges, and could use a little more understanding of fine art. But it’s a strong imaginative piece. 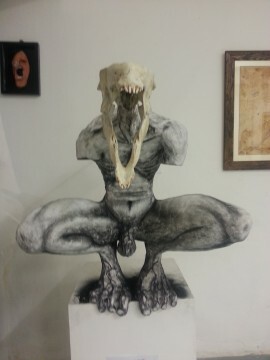 There’s a bit of a theme of ‘dead things’ in the show, with a thoroughly unpleasant photograph of dead mice by Sandra Heeks; animal skulls combined with sculpture by Orli Ivanov , which played to the steam punk crowd; and some taxidermy by Charlie Tuesday Gates. I suppose this is the type of thing the you either love or hate, and I confess I’m in the latter camp. I just don’t like art when it’s made out of actual dead creatures. The moving image program was something of a disappointment, since last year’s edition screened some genuinely striking and compelling works, but this year’s selection seemed to be a bit amateurish, to be frank. Aside from Giger’s, the best work in the show was a series of oil portraits by Jean-Luc Almond. They are small but completely mesmerizing. It’s difficult to describe them, but think about those old photographs that people made to try to convince you that they had photographed a ghost, crossed with a Francis Bacon portrait. Although it was quite an uneven show, once again, one is left wondering what Elphick would be able to do if he was given what he deserves: a decent bit of funding and the ICA. As the Institute of Contemporary Art, one would expect that that is exactly the kind of place that should be showing a project like Modern Panic, not a tatty studio in South Hackney. It is an indictment of our art establishment that somebody with Elphick’s imagination is on the fringes of curating in this town. Maybe that will change, but I’m not holding my breath. * I would not consider it ‘sound art’ by any established criteria I can apply to that form.